Straight after what is probably the most extraordinary performance I’ve seen on a racecourse in fifty years, my twitter timeline glittered with Wows! Bristol De Mai had just won the Betfair Chase by a margin usually associated with something like a Foinavon Grand National where a disaster occurs at a fence and every other horse is disadvantaged. Well, it took just minutes to learn that all of Bristol De Mai’s rivals had indeed been disadvantaged, ITV pundits, including AP McCoy appeared to agree, to a man, that nothing behind Bristol De Mai had ‘run its race’. The grey horse only won like that because today the rest were crap. Quite a few on twitter soon confirmed that this indeed was the case. I checked on The Racing Forum and, yep, sure enough, Bristol De Mai wasn’t actually much good after all. Really? Is this what racing wants to be? If you watched, have you ever seen anything like that in a Grade One? Ever? Does it matter that Bristol De Mai was better suited to the conditions than his rivals were? Why does this fact mean everything else was 35lbs below ‘normal’ form in the ground? Why wasn’t Bristol De Mai 35lbs above ‘normal form’? I get it from a historical handicapping viewpoint, but when a sport cannot glorify a performance never seen from even Arkle or Kauto Star or Denman or Sprinter Sacre, what stage have we reached? When we cannot celebrate a victory like that because every horse in the race must be given a pass, no wonder we struggle to gain fans. It’s not as if Bristol De Mai was quickly fitted with a hovercraft skirt or something before he jumped off. He was equipped exactly the same as his rivals. The reason they all looked second raters was Bristol De Mai. Had he not been there, everything would suddenly, in the eyes of the experts have run its race. The other horses were not amiss. They did not all have a bad day at the office. They were exhausted because of the pace set by Bristol De Mai. This beautiful big six-year-old grey horse just waltzed home by fifty-seven lengths in a Grade One Steeplechase and much of what I hear from veteran racing fans is carping. Seriously? We are in a sport where a horse would have been more highly credited for winning by ten lengths in a slower time. Think about that. It’s utterly ridiculous . . . shamefully so. A historic day in the sport, a memory of ten lifetimes for his connections sullied by excuses for the losers. Oh, by the way, there were six other winners at Haydock today. Arguably, all were better suited to the conditions than their rivals and none contested a Grade One. Add the winning distances of all six and their total still falls short of Bristol De Mai’s by seven lengths. The British Horseracing Authority (BHA) sent an email to trainers yesterday informing them that they would have to notify the BHA of certain types of wind surgery carried out on any previously raced horse in their care before that horse’s next run after surgery. The National Trainers Federation (NTF) is concerned about the new rule on several fronts. First, any rule change should have been prefaced by more research. The BHA has made it clear that its motive for implementing this rule is to provide information for bettors that might influence their betting behaviour. The NTF understands the desire to fulfil the needs of racing’s customers but in this data driven world, reliable data is essential. In the consultation we proposed that the BHA’s first step should be to collect data from trainers about wind surgeries carried out over a two year period. That data would then be analysed to assess the extent to which different wind surgeries have a significant effect on the performance of a large enough cohort of horses to have some confidence in the value of information provided to bettors. The BHA has opted to ignore the opportunity for an evidence-based approach on this issue. We believe that is poor regulation. The NTF’s other concerns include the impossibility of effectively policing the rule, especially in relation to horses trained outside Britain. Some types of surgery cannot be detected post-operatively. We urged the BHA to seek alignment from Ireland and France before introducing the rule. The BHA chose to make the running but we fear this will leave British racing connections at a disadvantage and undermine the objective of the rule. Racing folk on twitter got busy. Most applauded the news but a number of trainers, notably on my timeline Jim Boyle and Ralph Beckett, thought it a bad idea. I asked both men if they’d care to expand on what appeared to be strong feelings using this blog. Mister Beckett declined ( I see he has commented briefly on his own site today, but Jim Boyle was happy to let me publish his thoughts which appeared first on his website. Jim has been training in Epsom since 2001. He’s trained the winners of over 350 races and over £1.85m in prize money, with winners as far afield as Ayr and Hamilton, and runners in both Ireland and Dubai. A flurry of social media activity in response to the new BHA ruling on the mandatory declaration of wind-ops led recently to a number of trainers (myself included) being branded anti-punter, patronising and stuck in the dark ages, amongst other things. This was all for daring to air a different viewpoint to that espoused by the multitude of punters on Twitter who are convinced that this ruling was long overdue and essential. Even the newly elongated Twitter format wasn’t long enough for me to get my points across, hence this blog post. For a start, let me make it quite clear that I am not anti-punter. I fully recognise that the funding model of our sport is predicated on encouraging people to bet on it. Hence, if racing is to thrive, I am more than aware that we need to grow the betting market, not try to shrink it. So my thoughts on this issue have nothing to do with being anti-punter in any way. I would like to qualify that statement by also stating that betting should never be the only policy driver of our sport. The NTF were indeed consulted, but clearly not listened to, on this ruling. We voiced a strong opinion that if these procedures were to be declared, there ought to be an analysis of data undertaken in order to come up with robust, evidence-based information on the efficacy, or not, of various wind operations. We suggested a two year window to allow a sufficient sample size so as to be statistically meaningful. At the end of that period we could all be provided with useful information on various procedures that could inform both their application in the first place, along with their usefulness (or not) as a punting pointer. At this point it would have been easy to decide what information should, or should not, be put in the public domain. One well known punter tweeted that there had been 12 cases this year where in a subsequent stewards enquiry the reason for a massive improvement in form had been down to the horse having had a wind op. I asked which procedure this was, and of course he was unable to tell me. And herein lies the problem. The way the BHA have framed this ruling is that the betting public will be alerted the first time a horse runs after having had a wind procedure. But they will be completely in the dark as to which one. So not only will they not have that specific information, but even if they did have that information, they would be guessing in the dark as to how likely it was to have an effect. This punter said he would rather know than not know, as it would help inform his decision, but I just can’t see how. Let us say that those 12 cases he mentioned had been broken down into individual procedures, rather than all being lumped together. And let’s say that on analysis, of those 12 cases, 6 were shown to have been down to procedure A, 4 down to procedure B, 1 each to procedure C and D and none to procedure E. This punter has no idea whether the horse has had procedure A or procedure E. So how is he able to make a judgement call on whether the horse is likely to improve, or by how much? However savvy a punter is, I don’t believe he can make good use of incomplete information. And there will be plenty of less savvy punters who will be sucked into backing horses regardless. This to me is not a sound basis for putting information in the public domain. Now let’s say, as recommended by the NTF, we had two years of data on the various wind ops. The data could be analysed to provide, for instance, an average (mean and median) improvement in form on not only a horses first run back, but subsequent runs also. Now, there is a big caveat here that there will be many instances of all 5 procedures where there is no positive impact whatsoever. But a picture could be drawn up of how likely a particular procedure might be to have an impact, and following on from that, how much of an impact it might have. There would be other useful info gained, for instance, on how long these positive outcomes tend to last and so forth. I don’t know how any savvy punter could argue that this information would be infinitely more useful to them than what they are going to be handed. And the argument that this data analysis can be done anyway doesn’t really cut it for me – why for the sake of waiting two years should we be releasing data of very spurious benefit, when at the end of that period we could release proper, evidence-based and usable data. I recognise that there are still many people who will not agree with my viewpoint, and they are entitled to that opinion, but I would challenge them to define what part of this argument characterises a trainer as anti-punter, patronising or stuck in the dark ages. One of the keen debaters with Jim on twitter was the very successful At The Races pundit and tipster Hugh Taylor. Hugh also published a piece this morning and I’m grateful to him and to ATR for permission to reproduce it below. The wind operation issue has created lots of debate on Twitter, but even with the extended number of characters permissible (some may say especially since that number was extended), that’s not the ideal medium for in-depth analysis, hence this blog. The main objection by the National Trainers’ Federation (NTF) (and most trainers whom I have seen quoted) to the compulsory declaration of wind operations has been the lack of information about the effectiveness of the varied, different operations and procedures which will fall under the generic banner of “wind operations” under the new directive. In my opinion, it’s right and responsible that trainers are making this point, and many trainers have done punters a great service by highlighting the fact that there are so many differing procedures, that they are often ineffective or of limited effect, and that enough isn’t known about which procedures are most effective. It’s also easy to see the sense in the NTF’s suggestion that a two-year trial be undertaken in which the BHA collect data from trainers on different wind procedures undertaken and their effect on performance. What I can’t agree with, however, is the suggestion that, in the interim period, the current system should continue with no information given about wind operations. Consider the following situation. I’m looking through the form of a handicap chase. There is one horse whose recent form under similar conditions is very solid, and I’m interested in backing him at his current price. However, there are a couple of rivals who are returning from a short break who are troubling me before I back my selection. Both have run dismally on their last couple of starts under similar conditions to those they will encounter today. But both have form prior to that which suggests they would beat my selection if suddenly bouncing back to that form. Their profile makes me very wary that one or both may have had some sort of wind operation since their last run. On their recent runs, I make both 50-1 chances. But if they have both had wind ops, even if the chance of that wind op being successful is very small, that possibility will significantly change my idea of a value price about my selection. Under the current legislation, I have no way of knowing if my suspicion of a wind op is true, unless connections are kind enough to make an announcement before the race. But under the new legislation, if neither horse has had a wind op (assuming connections haven’t failed to declare an op), I will know that fact, and there’s nothing incomplete or confusing about the fact that a horse hasn’t had a wind op. That is going to have a significant impact on my betting confidence, and decision, in that race. Of course, there are other possible reasons why a horse might suddenly bounce back to its best for a reason that’s not in the public domain after a short break, having been completely out of form. I’ve seen various factors cited such as change of feed, change of work rider, change of shoe type etc. But I haven’t seen multiple instances of connections citing such reasons when interviewed by the stewards after a much-improved and winning performance, whereas I was very quickly able to find 12 instances this year alone of connections attributing a massively-improved (or back-to-form from out of the blue) winning performance to wind operations. Those are just the ones where the transformation was so big as to trigger a post-race stewards’ enquiry. As a punter, I recognise that the information we are set to receive from January about wind ops will be imprecise, and certainly not something to use as a single-issue punting strategy. But the decision as to whether or not that information is of use to me should be mine. Punters need to listen, and listen carefully, to the very wise advice that has been shared by many horsemen about the varied range of wind operations and procedures, and the incompleteness of information that is available about them. But it’s important that relationship is reciprocal; sometimes there can be things to be learned from punters, too. It’s only right that people who bet on horses have all the relevant information in front of them. Trainers have got nothing to hide. Surgeries have improved and science has moved on since the days of Party Politics winning the Grand National after being tubed. Cauterisation of the soft-palate is a routine procedure rather than an operation. It’s very straightforward, whereas hobdaying is a significant operation,” Henderson said. “Yet both will be coming under the one umbrella of wind surgery, and I have huge concerns about that. It’s a difficult issue. Once an issue has been declared you are tagging a horse for life that it’s had a wind op. I’m not quite sure what the point of that last line is. If a horse had a wind op last year or if it has one in January 2018, it’s a wind op just the same. The horse last year is surely and rightly ‘tagged’ with a wind op even though it did not need declared. One of the reasons I wanted a trainer’s perspective was that I did not understand the crux of their argument. Jim’s main point, and Nicky Henderson’s if I’m understanding it correctly, appears to be that the information is not fit for purpose, that there is limited quality to the data because each affliction and its proposed cure is being bundled with the other four and treated as one. It seems to me an argument born of frustration with the perceived usefulness of the information trainers are being asked to supply. At first I too thought that grading the seriousness of the ops was a good idea. I quickly came around to the BHA’s belief that only one classification was required; WS, for wind surgery, based on the logical premise that a trainer and vet are, in all cases, going to be working in the best interests of the horse and its owner. They will opt for the surgery best suited to giving the horse a chance of realising its potential, and that simplifies matters beautifully, I think. Such a system removes any need for punters to research five different types of surgery. It means that a simple WS on the racecard will suffice rather than one with codes added. I wonder what the reaction would have been had the BHA opted for what some are now proposing? If they had said that they want a separate classification for each op I suspect that quite a few trainers would have been saying, ‘Do you think I don’t know my job? Do you think I employ a nincompoop for a vet? The horse will get whatever surgery it needs.’ I’m not suggesting that Jim Boyle, Nicky Henderson or Ralph Beckett would argue in such a fashion, I’m just trying to illustrate the fact that however they structured this, the BHA would probably have drawn protest from trainers. “Many thanks for the quick response. It seems though that the answer is that there are some wind ops which will not be declared. My thoughts are that a clarification of that at the time of issuing the release would have achieved clarity. As it is, the picture is still cloudy on the information front. If anything, I’d expected protests from trainers on the basis that it was a lot of hassle or that it would unsettle owners or that the bloodstock market as a whole would be adversely affected. These, although not arguments that would have changed BHA plans, would at least have been more understandable to the public. Instead, the tone of the NTF’s response allied, perhaps, to the inadequacies of twitter for nuanced debate have led to the types of reactions Jim Boyle mentioned where people are turning on trainers and snapping at them. It seems to me that the NTF ought to have put a much more positive spin on its actions and briefed members accordingly on how best to voice individual concerns. Nobody seems to be protesting the main objective here – to give punters what they’ve long sought. As such, the sport would, I think have been much better served by a united front. Should the BHA share the blame here? Who knows? There have obviously been discussions behind the scenes on this for some time. Agreement could not be reached and the BHA appears to have taken an adversarial stance. But maybe the debate reached deadlock. It’s tough being a regulator and it’s tough being an industry body like the NTF. But surely they should have come to some agreement on how to present this so that both bodies – and therefore the sport- could be seen in the best light? A way could, I’m sure, have been found for trainers to express publicly their concerns at least enough to merit a ‘told you so’ at some point. And it could have been done with subtlety. Instead, the NTF have been left amidst a perceived storm of toys flying from prams. They’ll feel unfairly treated as will Jim Boyle, Ralph Beckett and others who share their concerns. In PR, Racing needs to do a better job than this. Sadly, another row has erupted over anti-doping rules, so the prospects of improved relations look poor. Before the situation worsens, lets hope the BHA and the NTF agree to hold hands at least for long enough to go and see a counsellor. So, over to you. The comments section is open and will remain so until this has run its course. My thanks again to Jim Boyle and Hugh Taylor. Punters contributed more than £54m to UK racing last year via the levy scheme which taxes bookmaker’s profit on horse racing. We paid more than that again via the media rights fees tracks earn from bookmakers. I’m not going into the debate on closed and restricted accounts here. That’s under the control of the bookies and while I accept the principle that no business can tolerate customers who consistently damage its profits, too many ‘innocents’ are caught in the fusillade of algorithms. Anyway, that’s an argument for another day. I’m interested here in what racing can do, with a wee bit of forethought and consideration, if not to help punters then, at least, not to make things harder for them. Three recent examples: In September Nicky Henderson gave the Jockey Club press folks a nice quote about the first leg of their Jockey Club Million project, the Betfair, saying it would be a logical place for Might Bite to start. Cue punters taking antepost prices not just about the Betfair itself, but grabbing some of the 50/1 about Might Bite to land the treble. Twenty-four hours after Henderson’s quote appeared in the Post, another quote from him started back-pedalling on the Betfair. What he’s said since indicates that the horse was never likely to turn up at Haydock. When the Jockey Club sought a quote from him he should have given much more thought to its potential effect on punters. On Monday, Ruth Jefferson, the trainer’s daughter, mistakenly declared Cloudy Dream for the wrong race on Saturday. 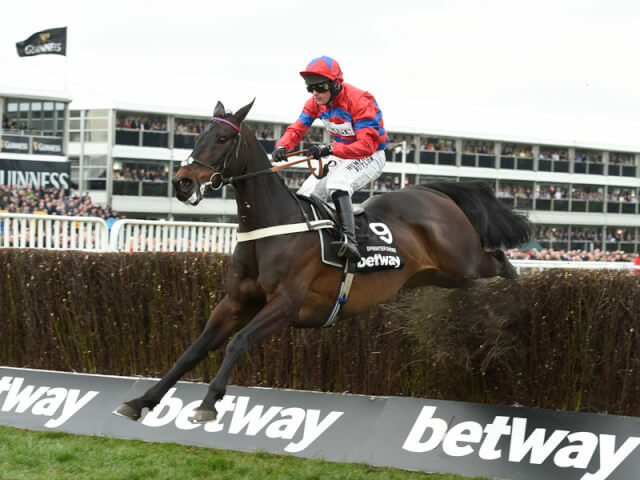 He’d been entered in Cheltenham’s feature, the Betvictor Gold Cup but was not declared at the five-day stage on Monday. He was entered instead for the staying handicap chase on the same card. If the NTF were to put to members the proposal that some leeway should be found for Cloudy Dream-type errors, I suspect they’d get resounding support. Every trainer must know that he or she is only a mini-crisis or concentration lapse away from making a similar blunder. Such mistakes are far from unknown. So come on NTF and BHA, get together and strike a blow both for connections of a horse and for antepost punters. The fact that some bookmakers refunded stakes on Cloudy Dream doesn’t alter the fact that changes are needed. On Monday the Triumph Hurdle winner Defi Du Seuil, a warm order for Sunday’s Greatwood Hurdle, was declared at the six-day stage to run in the race and was separately reported, in a quote from the owner’s racing manager Frank Berry, to be on course for the race. Twenty four hours later they withdrew him. He’d been backed into favourite and they took him out although he was fit and ready. Trainer Hobbs said: “In discussing the situation with connections, it has been decided that the hurdle at Ascot will be a more favourable first run of the season. There it is. No apology. No mention of the money lost. And, incidentally, as was pointed out on twitter today, the horse won the Triumph Hurdle in March when he was even younger; a race hardly lacking in the hurly burly factor. Again, I did not back him for Saturday but many did, and they are simply ignored. Not even a nod to them by connections. One of the BHA’s key targets is to increase betting turnover on the sport. Promoting awareness among the decision makers, owners, trainers and racing managers of adding the interests of punters to the mix before they make announcements or decisions would go some way toward helping the BHA meet that objective. And reviewing the rules governing errors in declarations could also bolster punter confidence. I think Racing often views punters as having only a tenuous connection with the sport when, in reality, it is we who pay the piper. Why do we never get to call the tune? Edited at 11 a.m. on November 16th to include a link to this interesting thread on twitter. For non-tweeters, in summary, it covers the timeline of Henderson’s announcement about Altior’s withdrawal from the Tingle Creek and mentions his blog contract with a bookmaker. More fuel for the fire around which punters are getting burned. “Scunner’ is a Scottish word that means strong dislike or disgust. If your scunnered with your commute you’ve had about all you can take. A few racing folk have been scunnerred today by small fields at Kempton where there were two matches (2-horse races). and one 3-horse Novices Hurdle. Why is it happening? The favourite theory is that trainers of not so good horses do not like to run against good horses in non-handicap races. If a horse of relatively low-regard finishes with hailing distance of the future stars, trainers believe its handicap mark will be unfairly affected. No handicap rating increase in weight-for-age Novices’ Chases of Class 2 and below other than for the winner. This will only apply to horses who have already made four appearances over obstacles (either hurdles or fences) and be introduced on a trial basis.This system mirrors a trial which is being implemented in Flat conditions races in 2017. While it is not borne out by handicapping data, it is understood that a preconception exists amongst trainers that running in close proximity to a higher rated opponent in Novices’ Chases race may result in a significant rise in a horse’s handicap rating.The working party felt that perception can be as important as reality and to encourage more horses to run in weight-for-age Novices’ Chases, trainers’ preconceptions of the handicappers’ reaction needs to be addressed. That amounts to a written promise to trainers, but if today is an early litmus test, they’re not buying it, preferring to take the view that Phil Smith and his Peaky Blinders will be more inclined toward the fierce-eyed stare that says “I know where you live”. The £100,000 final for novice chasers will take place at Ayr on 21 April 2018, which will also provide an additional boost to Jump racing in the region through the provision of a high value, end of season target. The final, which will be run over three miles, has been created to support the recent changes resulting from the novices’ chase review, and will be an open novices’ handicap steeple chase. In order to qualify for the chase final, horses must have finished in the first eight in at least one weight-for-age novices’ or beginners’ chase during the 2017/18 Season. One point is awarded to every horse who ran in but did not win a qualifying race, so a yard that has sent out, say, 20 runners gets 20 tickets in the draw. Winner gets £60,000, runner-up gets £30,000 and the third, £10,000. Crude, unscientific and probably unfair but it might just work a wee bit better than the alternative. On September 21st Jockey Club Racecourses announced its 2017/18 Chase Triple Crown incentive promising a £1m bonus to any horse winning The Betfair Chase, the King George, and the Gold Cup, all run at Jockey Club tracks. When announcements like this are being planned it’s common to contact trainers seeking supportive quotes and the Jockey Club published positive comments from three trainers – Jessica Harrington (Sizing John), Nicky Henderson (Might Bite) and Colin Tizzard (Cue Card). Not an outright commitment but sufficiently positive to tempt me and others into taking 50/1 about Might Bite winning the big bonus. Some would have been tempted to back him outright for the Betfair. But Henderson very quickly began pedalling backwards. “The £1 million bonus is very commendable and the point of it is to attract the King George horses – you can’t win it if you don’t win the first leg, so everyone is going to want to turn up at Haydock and we could, as the Betfair Chase has its attractions, but I’m not convinced it’s the best place for him to start. “This horse might just be better suited to having, if possible, an easier preparation race for the King George, rather than what is likely to be a very tough race at Haydock.” Since then the trainer has continued easing his way out from his initial quote finally reaching the stage today where he says the horse won’t be going to Haydock. I like Nicky Henderson. He’s great with the press and I’m sure that all he was trying to do here was support racing and back a headliner project. But it seems plain now that he never had any true intention to run Might Bite in the Betfair. I’ve been betting antepost for decades, mostly on the festival and am well used to setbacks, most of which I accept as part of the normal risks (I say mostly: the business with Vautour and his Ryanair rerouting made it very tough to smile and carry on regardless). But punters put £4.5bn a year into UK racing and where people like Henderson can cut us some slack rather than rattling off a quick paragraph for Jockey Club friends to stick in their press release, it would help a little. Potential fans can be plied with every marketing trick in the book but in the end, you either get racing or you don’t. It’s not Marmite: plenty people are happy to have the odd day out at the races, but the ones you’ll hold and keep for life are the ones who “get it”. I don’t think you can crystallise the “it” that’s to be got. I suspect that much has to do with the challenge of sharpening your skills to such an extent that you can compete with and sometimes outdo the experts in picking winners or identifying future champions. It’s a personal challenge. You can seek mentors and read Timeform and the Racing Post and watch TV analysis but there are nuances that can only be learned, not taught. Skills can be developed that are so exquisite those who possess them cannot describe them in words. One thing I’ve noticed is that committed racing fans often show similar personalities, typified perhaps by optimism and a ready sense of humour. I’d happily bet that if we were all given a psychometric test the results would show many other shared character traits. And therein lies a potential solution. Supposing 10,000 of us volunteered to take part in extensive psychometric testing? We’d end up with a highly dependable profile of the personality of someone who “gets it”. Armed with this data, the marketers could target those who fit that personality profile. Worth a try? The comments section is always open on this blog. Let me know what you think. Cheltenham’s new season started today. Over the summer, the second-last fence has been moved ‘seven or eight yards’ (Sophia Dale, Cheltenham’s communications manager) closer to the last fence. The fence had only been in-site for 6 years having been moved 239 yards in 2010 from its former position near the foot of the hill before the turn into the straight. The key reason for the move appears to be that 6 horses fell at the fence at this year’s festival. Cheltenham offered a comparative figure of an average of 3.4 fallers ‘there, between 2007 and 2016’: I assume this is up to and including the 2015 festival, but that is not clear. Nor is it clear why 2007, 08, 09, 10 have been included in the 3.4 figure as the fence was not in position for those festivals. What might complicate matters further is that from the season the re-sited second-last first came into use (2010/11), runners in races over two miles and two and a half miles had an extra fence to jump. The less cynical side of me assumes the figures are a communications malfunction and are linked to some of the figures associated with the 4th last fence on the New Course which has also had its position ‘adjusted’. No doubt the executive will clarify at some point. But could there be another reason? Sophia Dale said, “The faller figures at both fences have been slightly creeping up, so we spoke to the PJA [Professional Jockeys Association], who had given us some feedback anyway, and moved the fence to give the horses a bit more time to get themselves together when they come off the bend.” Despite possible conflation of casualty figures, it is clear from reference to the bend that, in this quote, SD is talking about the second-last. I wonder what was in that feedback from the PJA, and was it sought or offered? “They jumped the plain fence and ditch on the back straight and came down the hill over the third last. They were going very fast and seven horses came around the corner – Paddy Brennan, Carl Llewellyn, David England, Sam Waley-Cohen and Sam Twiston-Davies were among those riding – and the bend rode beautifully and they jumped the fence. “We were happy but Nigel’s gang wanted to do it again. So they went back up the hill to the third last and one of the senior jockeys who is now retired said they went off with their tails on fire. …delighted to discover horses get 15 strides between turn in and the second last fence, then another 16 to the last. Evidently a bit more space to play with than anyone, myself included, had necessarily reckoned with. I can’t find that original Thornton quote on the RP site, but I have immense respect for Jeremy and am happy to take his word for it. So, 15 strides from the turn-in now becomes 16 strides, leaving only 15 strides to the last; we must wait and see what effect that has. And does that single stride that’s been gained really make such a difference? Could it be that the faller figures “slightly creeping up” (SD), could be something to do with the way the fence is being ridden? If so, what will jockeys use their extra stride for? Or might it be that the fence was sited wrongly in 2010? Was it perhaps an error that Cheltenham were reluctant to admit to relatively soon after the change was made? Cheltenham’s communications error (or obfuscation) today certainly hasn’t helped. One prominent journalist was fobbed off when requesting more information on the figures, apparently with the excuse it was a busy raceday today. I suspect all is not as it seems here. I’ll leave the Racing Post‘s Nic Doggett to sign off with a highly prescient piece from six years ago, written just after the Paddy Power meeting. A lot has been written about the re-siting of the infamous second last but from the evidence of this meeting the historically troublesome obstacle is still just that. Two fallers in the Novices’ Chase won by Wayward Prince brought the total number of fallers at the new fence to seven, a whopping 50% of all fallers at the track since it was moved. Fences late in a race will always be responsible for tired fallers, however I cannot help but wonder whether the new position is at an awkward spot for horses because of its proximity to the stand. The noise and sight of the grandstands really hit you when turning for home and this must be distracting for horses. Couple this with tiredness. Then add in what appears to be a landing area that looks slightly too low, and I think it will continue to cause problems. The worry is that it’s hard to move the fence further up the run-in because then you’d have an inadequate gap between the final two fences, but put it back much and it’s too close to the bend. This looks likely to run on and on, I suppose much like the argument over the old siting did, and I can’t think think of any easy solutions. Can you?